The PBC has built new police stations in several communities across the City of Chicago. These new facilities, with their up-to-date technology, replace outdated stations that, in many cases, are 50 years old. The new stations use a prototype design, with 44,000 square feet incorporated into a layout that offers open floor plans and inviting interiors, as well as community meeting spaces and neighborhood relations offices. Not only does the prototype design control costs and streamline the building process, it delivers a police station that serves as a cornerstone of the community: inviting to residents and comfortable for officers, helping them deliver outstanding service to the communities they protect. The community participation fostered by the new district stations is consistent with the Police Department’s Chicago Alternative Policing Strategy (CAPS) program. Building on traditional policing by incorporating problem-solving activities as a primary responsibility of beat officers, the CAPS community policing model works with residents and other institutional stakeholders to identify and prioritize problems affecting the beat and to develop solutions to those problems. As each new station is built, its surrounding neighborhood benefits from considerable infrastructure improvements: attractive landscaping, new alleys complete with secured trash compactors, improved sidewalks, sewers, streetlights and traffic signals. 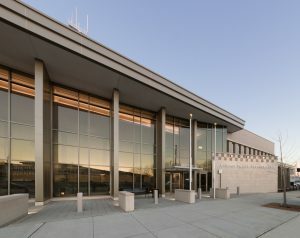 Further, the designs for all new police stations include features that qualify the building for certification under LEED standards.